Reliable, accurate, safe and AFFORDABLE! 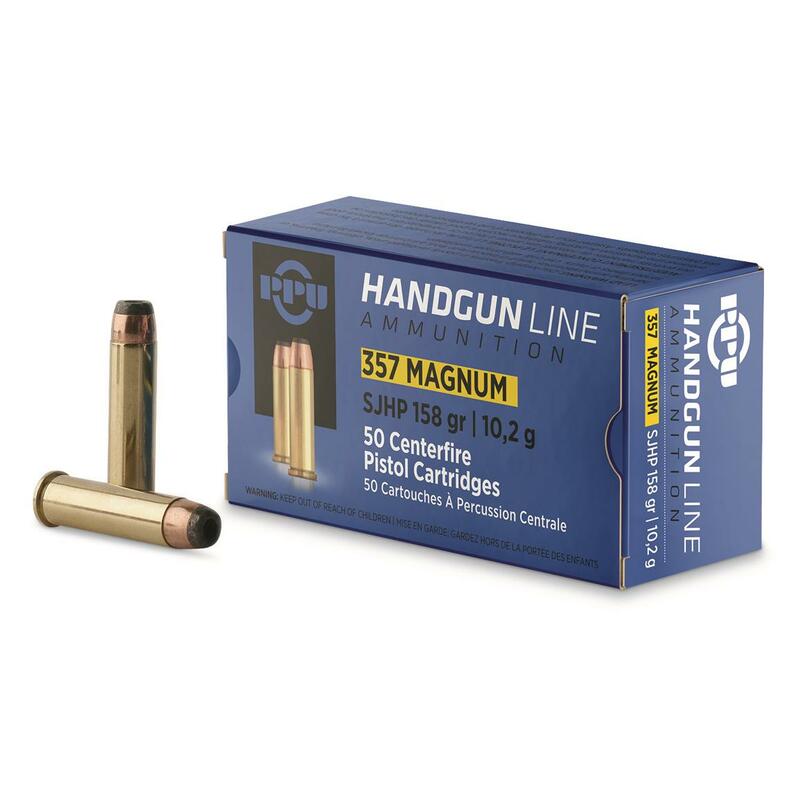 PPU, .357 Magnum, SJHP, 158 Grain, 50 Rounds is rated 4.8 out of 5 by 38. Rated 5 out of 5 by DavidnVanessa from Super high Quality This ammo is REAL hot. We are using it in our Coonan 1911-357. It feeds flawlessly. Plus... it is real good looking brass. Rated 5 out of 5 by Michael from Good stuff Has a kick to it. Feel safe with this ammo as it is a mover. Good to go hunting with as it packs a punch, accurate. Rated 5 out of 5 by Jerry from Excellent These are great rounds for a great price as well. Very accurate and never jams. Rated 5 out of 5 by Ronno from Great price on an awsome round Very powerful, accurate ammo. Rated 4 out of 5 by KenB from Brass ammo at a good price This .357 mag ammo works well in my revolver. Its price is among the lowest for brass-cased .357 mags. Rated 5 out of 5 by Gary from Funtions well-accurate-clean buring This ammo functioned perfect in 2 Lever action carbines and shot perfect windage and has super ballistics. Great bargain price!! Rated 5 out of 5 by Ronald G from Good Accurate Ammo I shoot the PPU ammo in my 9mm and it shoots great so I was hoping that this 357 mag ammo would shoot close to what kind of accuracy I was getting out of my 9mm and again PPU ammo did not let me down it is very accurate in my Taurus model 627 with the 6.5" barrel Now I will say it is not the cleanest shooting ammo but I don't mind a little extra cleaning when the price is great and the accuracy is superb as well.. Rated 4 out of 5 by crazy smurf from COULD NOT PASS UP THE DEAL Could not pass up the deal the price was rite. haven't shot it yet but I'm sure it will be just fine. Balanced velocity, accuracy and recoil for perfection.